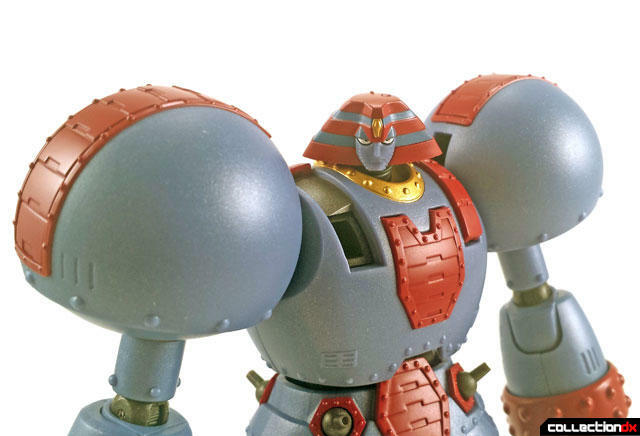 I know I'm late to the party, but Giant Robo is my first experience with the SRC line and although it's far from my favorite character, it's nice to have it on my shelf again after selling off all my modern chogokin years ago, including the Yamato version of this character. So how does this one compare to that one? Let's take a look and find out. 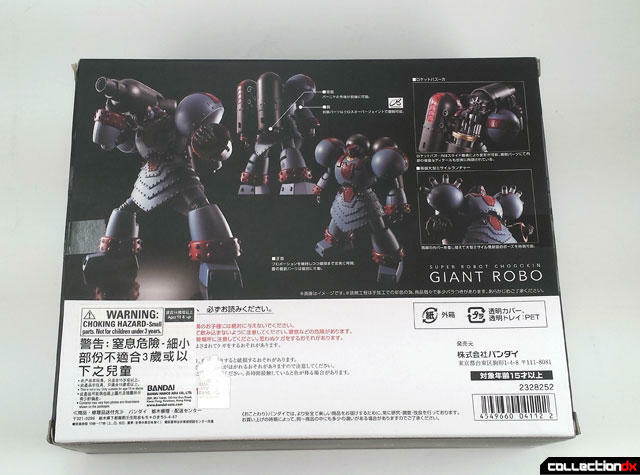 Giant Robo comes to us courtesy of Angolz.com. First, I'll take a look at the packaging. 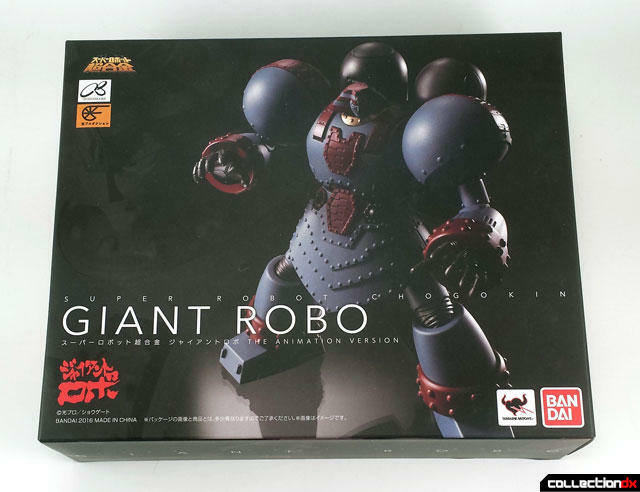 Giant Robo is packed in a very elegant looking box. 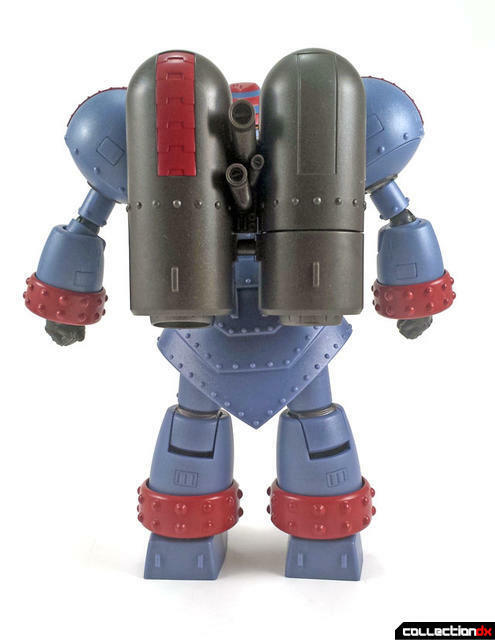 Images of the toys are shown on all sides and photographed with minimal lighting, giving the overall presentation a very serious look. The only place it brightens up some is on the back where much of the legalese is presented. 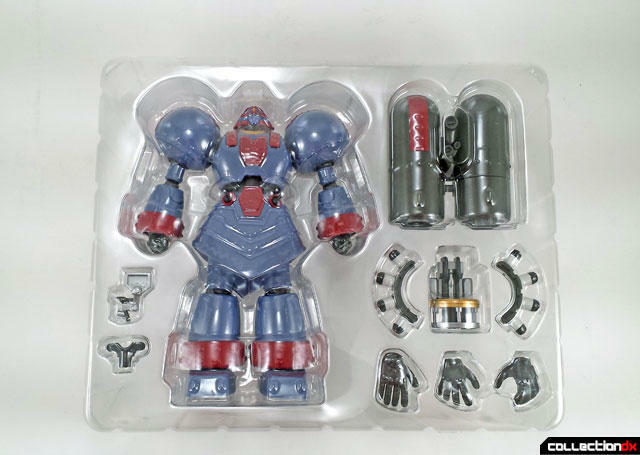 Inside the box, the toy rests in a plastic tray with the figure and it's accessories neatly laid out in the appropriate insets and covered by another piece of plastic. I know that in some toys removing that plastic cover might cause all the parts to go flying if you're not careful, but I had no such issues here. Removal of the figure was a breeze. By and large, the toy is pretty easy to figure out but it does have a couple of gimmicks that might need explaining so you get a nice instruction sheet for that. The first time I held the figure, I was a little confused. It had the weight of die-cast toy but it seemed that the entire thing was made out of plastic. This is in stark contrast to the Yamato toy which was a solid brick of metal. I ultimately realized that the only metal content seems to be the red bands around the wrists and ankles. 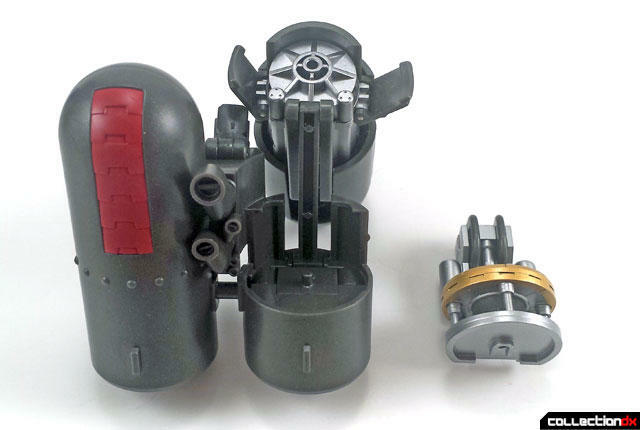 This doesn't seem like enough metal to account for the full weight of the toy and it appears that there is more on the interior of the figure. I can actually see some metal parts that connect the legs. So although more metal would certainly have been welcome on the exterior of the toy, it does still have a satisfying feel to it. While the Yamato version can claim superiority in the category of metal content and size (it's about 1.5" taller), I feel like this version has even better articulation. Most of the important places are on solid ball joints, the waist swivels and the knees have a satisfying, clicky pair of ratchet joints. 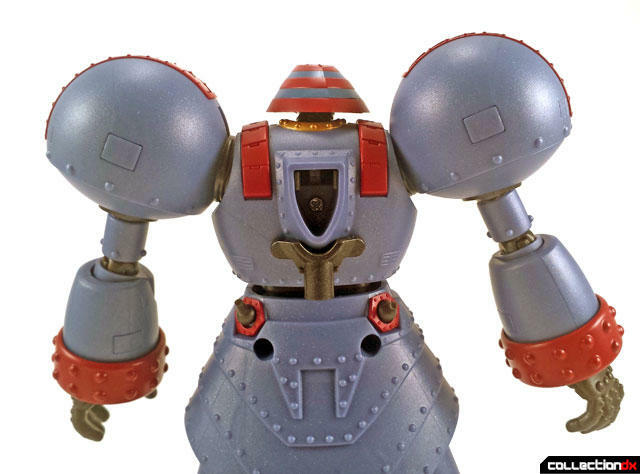 Even each individual small cannon along the waist is on a moving ball joint. Sadly, one of mine kept popping out as I was playing with it. It would pop right back on, but since it's such a small piece, be careful that you don't lose it if that happens. 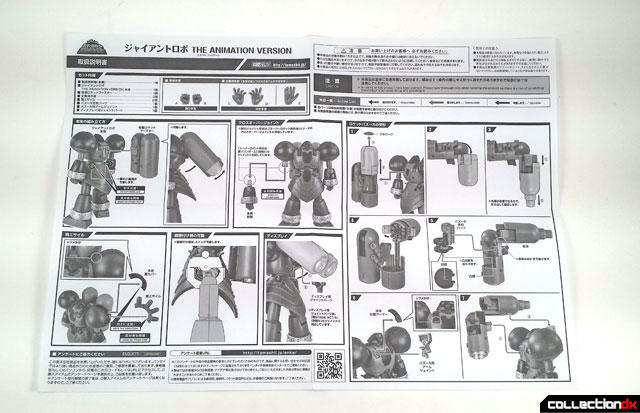 In fact, the instruction sheet actually says the same thing. 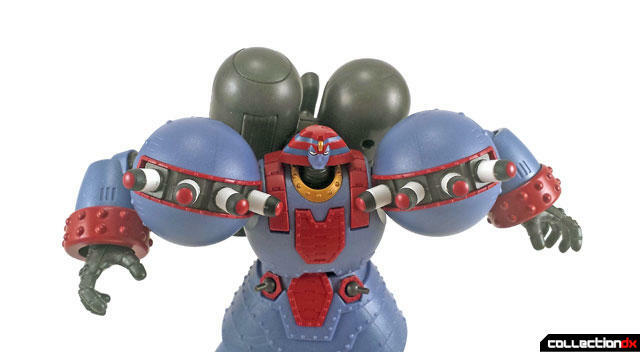 My other concern about this toy is that the arms are attached merely by friction. 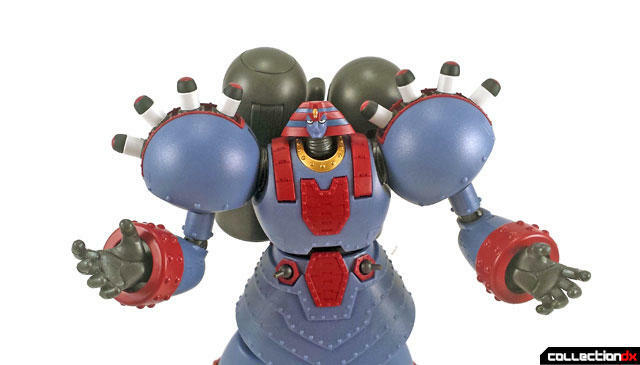 You can pull the lower arms right out but I worry that if that happens too much over time, they won't stay in place. 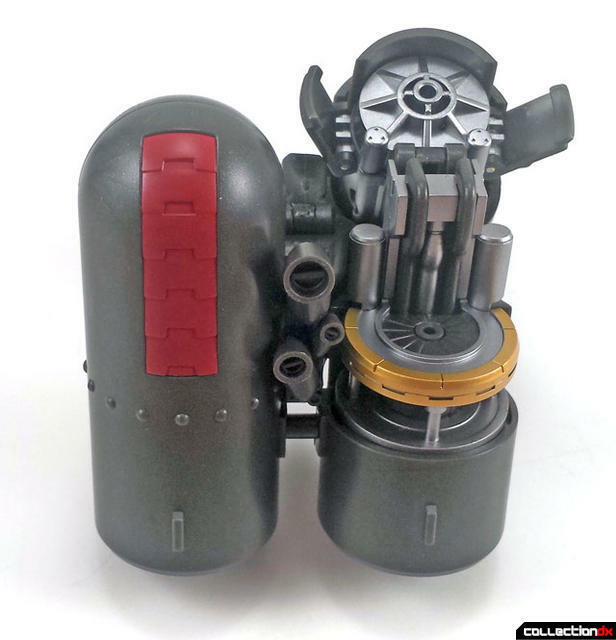 I would have loved to see magnets in there to secure them and outside of a lack of die-cast content, that's probably my biggest issue with the toy. But time will tell if it's really even an issue at all. It's no surprise that the figure will have extra hands, 5 in total. You get the standard closed fists that you can see in the pictures above, plus a pair of open fists. One open palmed fist is also included. Another place where this toy improves on the Yamato one is that both of the character's main weapons are included on this one toy. No having to buy an extra figure just to get the full arsenal. 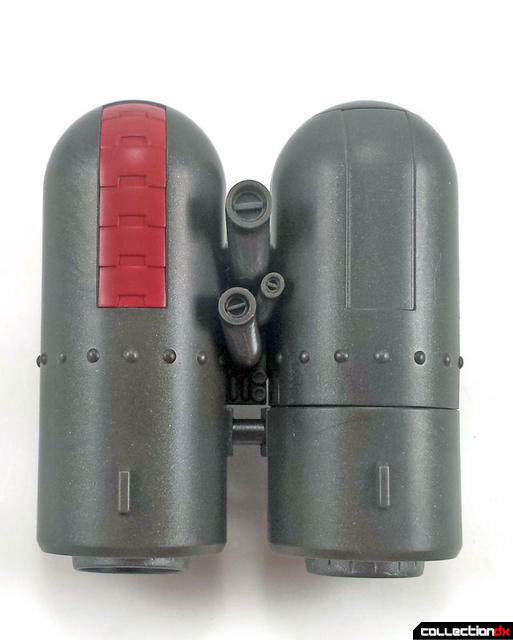 Like before, you can pop out the red parts of the shoulders and replace them with a row of missile launchers and with a wider range of motion, you can point them just about anywhere. He might not want to point them right at each other though! 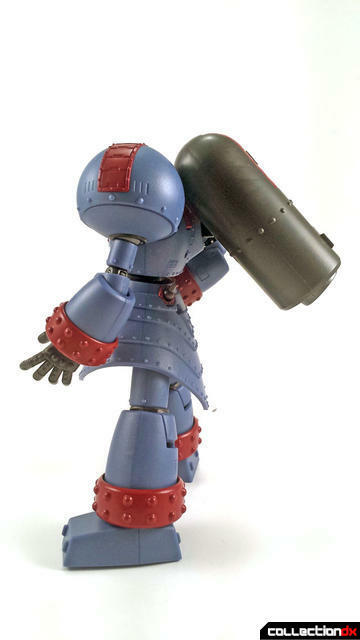 As for the bazooka weapon, that is concealed within the rocketpack, which attaches via magnet, unlike the arms. There is a small plastic piece that inserts into the back but frankly, I'm not sure the point of it. What little I can make out from the Japanese language instructions seems to mention something about display but it doesn't really seem to do much. There is a hole in the bottom of it so maybe it's for a separately sold stand attachment? I don't know. Let me know if you do. Anyway, the rocket pack can be rotated or elevated as needed. To reveal the bazooka, pull one of the cylinders up and turn it out. Remove the cover and the end can then extend via a telescoping process. After you do this, it leaves an empty space where the cylinder once was so the toy includes a decorative piece of interior machinery that you can then put in there to make it look nicer. Next, you'll need to remove the red piece over the right shoulder and insert the harness for the bazooka. Finally, combine it all together for a very powerful looking weapon! I have to be honest, I made that sound a little easier than it really is. That harness on the front doesn't really snap into place. Again, it just slides in and is held by friction. So I found it to be a bit of a chore to get it to connect to the bazooka without coming back out of the shoulder. But once it all came together, it looks pretty impressive. 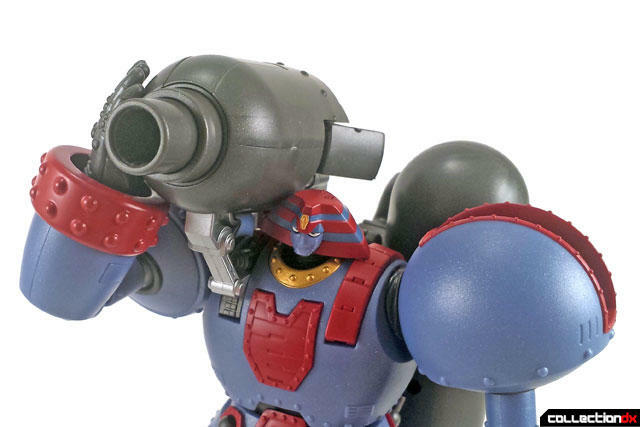 This is why the fifth and final fist is include, to steady the bazooka as it fires. And if you really wanna go all out, you can use both weapons at once. 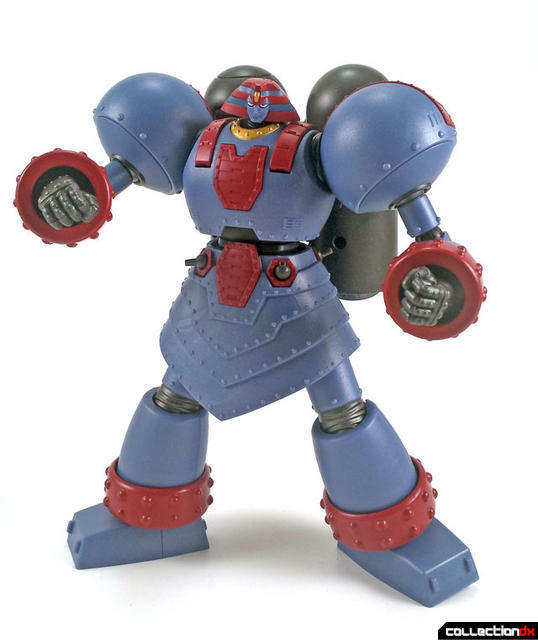 Ultimately, I think I like this one slightly better than the Yamato version, despite the lack of die-cast. Whether it's the sculpt or the increased articulation, something about this one just seems to be a bit more expressive than the other. Somehow it feels a little less awkward. Add in that it has both weapons and even a more attractive looking box and it's a winner, even if it's not perfect. You can get yours at Angolz.com. Welcome to the fun smaller sized world of SRC's. You will find lots of delightful goodness among them. And thank you for a nice concise review. I've been debating this guy since I have the Yamato. But I do think I mainly like him more. The friction connections for the forearms are intentional. They are a crossover joint system. You can swap arms between a number of modern SRC figures. 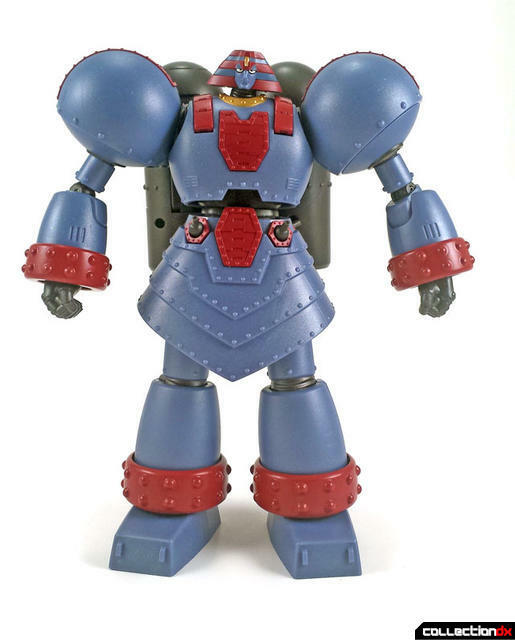 Mazinger Z, Great Mazinger, Grendizer, Kantam Robo, Getter 1 etc. And they all can share Rocket Punch effects parts. 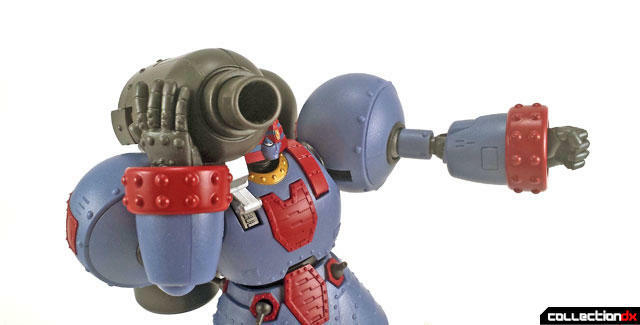 I honestly don't know if Anime Giant Robo has a Rocket Punch? 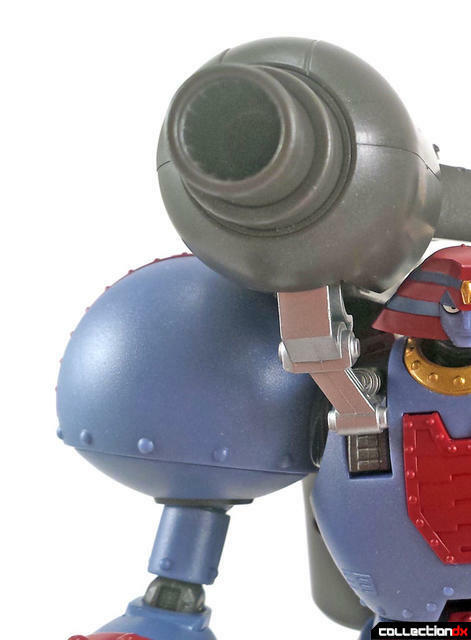 But you can use the Mazinger Z or Great Maz effects parts to give him one. Similarly the point where his backpack connects should be a crossover joint. 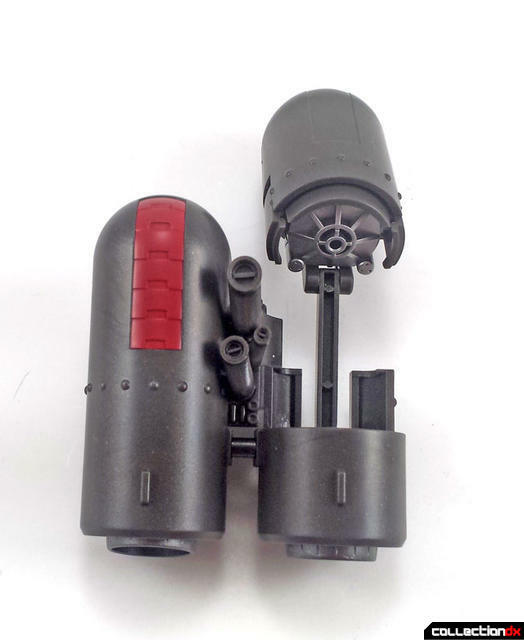 So you can alternately attach Maz's Scrander or Mazinkaisers Wings etc. Believe it or not this guy looks to be one of the less articulated SRC's, just by the nature of his design and shape. Some of the others get crazy for what you can do with them. 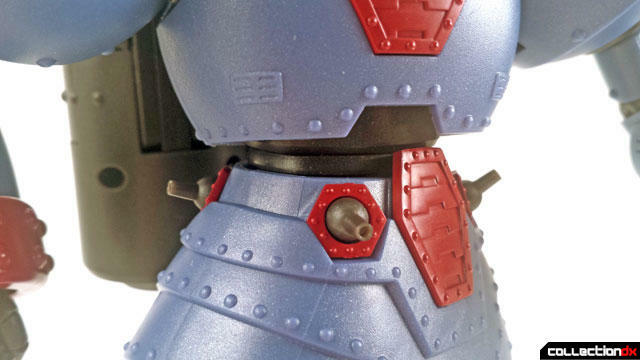 That extra part on the back looks to be a Tamashii stand attachment. So in theory you can pose him up in the air jumping or flying? 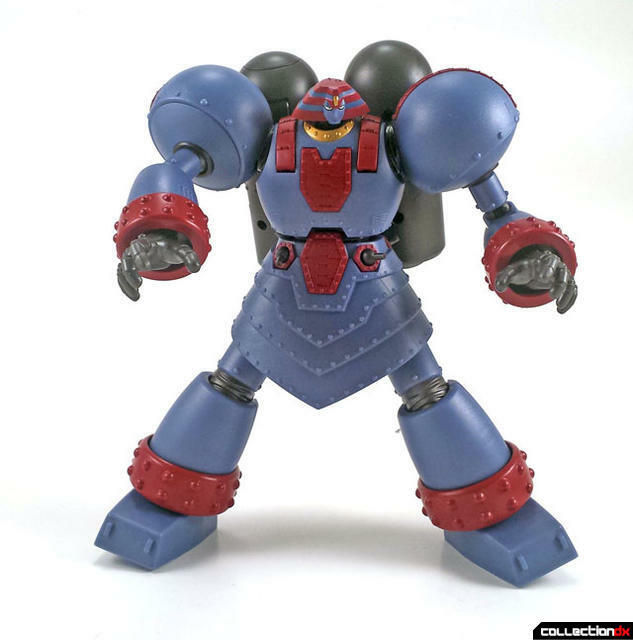 While Bandai generally puts something along those lines in with each SRC, there are a few such as DaiGuard and Alteisen where it's use is strongly not recommended due to weight and shape. I'm thinking this Big Boy probably falls into that category as well. He looks to be a "keep feet on ground" robot if I ever saw one. 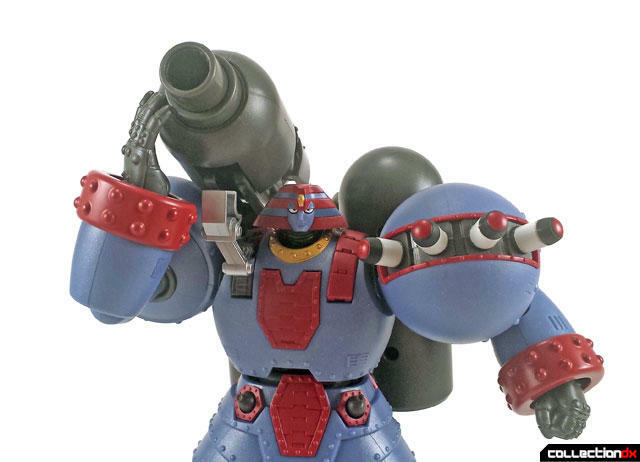 I'm rather disappointed that while they did the shoulder missiles, they didn't do the ones for the collar or the chest missile/cannon. Nice thorough review. 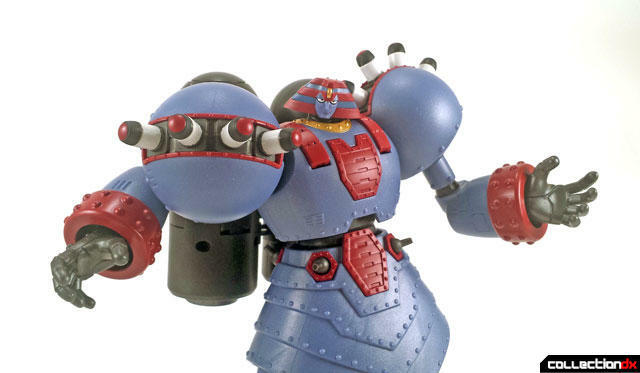 I am just excited to still be getting SRC, After God Sigma I was a little worried, although it sold poorly it's by far my favorite and I am hoping we get that God Mars as an exclusive eventually. I would really have to hate a character not to support the line. Needless to say this is preordered. Long live SRC. Nah! I don't think there is that much risk of SRC going away. Bandai really doesn't end full lines that often. Sub lines within them come and go, so we may see a fading of say Brave SRC's or such. But I don't think the SRC line itself is going anywhere. If anything they may focus more on it as the lower cost entry point for the higher end collectors market. SRC God Sigma is a fantastic figure. Just a little light in metal and stature. The only real issue with it, that left it a shelf warmer, was the insanely inflated MSRP. I am sure we will see a God Mars at some point. In fact Bandai will eventually get around to every SRC for which they have shown a prototype. Big O, Godanar, God Mars, etc. They just move at their own speed and in their own random order. So I finally got this guy in hand. And the survey says... Meh! Not a bad figure, just an incredibly unexciting one. I actually hope NekroDave is not forming most of his opinions of the SRC line around this guy. I actually think I almost like the Yamato better. While the SRC has better articulation, it looses points for having a rather distracting unpainted swirly pearlized blue plastic outer skin. It has weight. So it has metal inside. 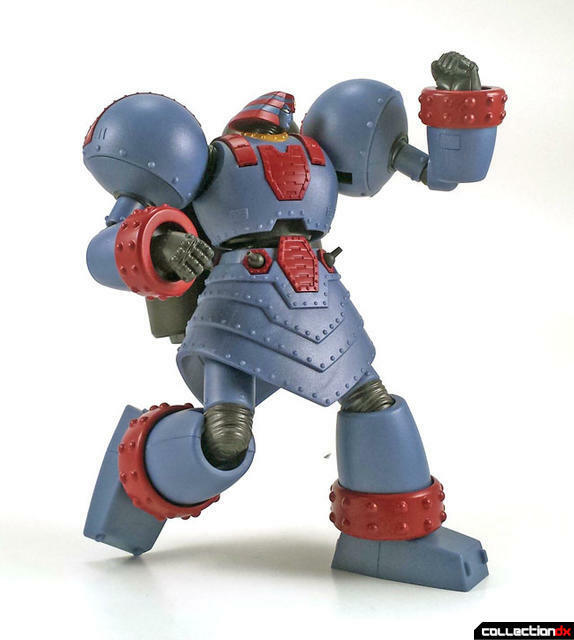 But the swirly finish seems awful for a robot that looks best as a shiny battleship grey lacquer. A few other details distract and annoy me, such as the odd gap that pops up conrantly when positioning the head and neck. Oh and I stand corrected. The backpack on this does not use the common universal connector. It's it's own unique shape. Bleah! The weird looking connector piece is a Tamashii stand adapter. Which is fairly useless given this things size and bulk. 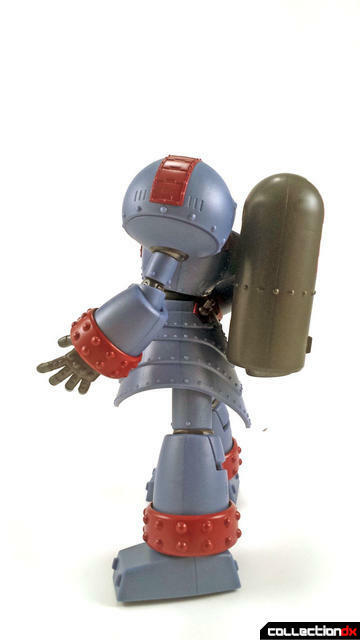 A nice robot for fans of Giant Robo. One of the weaker SRC offerings. Worlds apart from Grendizer or the Brave bots or the Sentai's. Not a bad robot, just not an Alister. Call this guy a B-. Middle to lower end of the line. GR2 likely would have made for a better SOC subject with more metal and features.